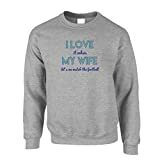 You Love Your Wife! But you love her even more when she let’s you watch the football! This design is also printed on Womens/Mens Tshirts, Hoodies and Aprons – Please check our other listings. Our Sweatshirts are all printed to order using the latest in Direct to Garment printing technology. We print the ink pigment directly within the fabric of the sweatshirt, which gives a superior quality print that that will withstand repeated washing but is soft to the touch and doesnt crack like many screen printed sweatshirts do. Your sweatshirt will be manufactured expertly and with care in the UK and shipped to you rapidly with our no quibble satisfaction guarantee. We only use the latest, top of the range printing techniques and equipment, for the ultimate in long lasting design wear and only the highest quality of garments. Tim and Ted are fashion designers and printers based in Bristol UK. We draw inspiration for our printed designs from our interests of funny slogans, internet Memes and general humor. All our designs are 100% original and are created at our in house design studio by our team of professional designers. Shop4yoo are exclusively licensed to sell Tim and Ted branded apparel and T-Shirts. We have an awesome team of printers based in Bristol who use the latest digital printing technology. As a result this provides a much high quality and longer lasting print than screen printing. We are so sure you will love your new Sweatshirt that we offer a full 30 day money back guarantee. This entry was posted in Soccer and tagged Football, jumper, Let's, Love, sweatshirt, Watch, Wife by FPSports. Bookmark the permalink.